I'm going to be lazy and lift the details about this Kawai guitar straight from the seller's description on eBay. When it's already been said so well, why re-write it? The downright weirdness of this guitar may be lost on most of you, but for those collectors of 1960s Japanese vintage, bizarre and lawsuit guitars, this thing is so bad it's good. 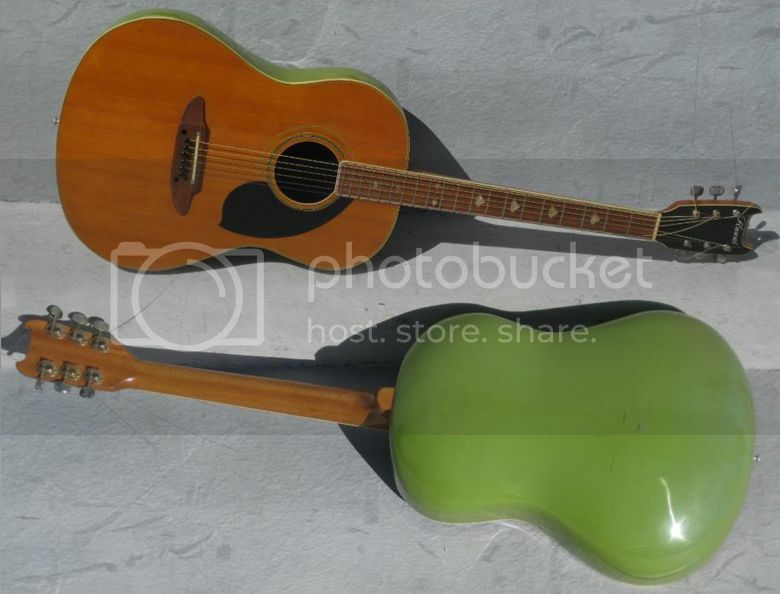 What we have is a 1968 Kawai knockoff prototype of what was at the time one of the strangest and most novel pieces of guitar technology out there: the Ovation smooth-bowl Glen Campbell model. You gotta give it to the Japanese, they didn't waste anytime. But not only did they copy what is now perhaps the rarest and most sought after Ovation, they one-upped them as well in the strangeness category. First off, the smooth FRP resin bowl is LIME GREEN! On top of that, the neck is triple-bound, the headstock is pointy and devilish and capped with three-ply laminate and an awesome Kawai emblem, and the fingerboard is inlayed with upside down Teisco Spectrum 5 inlays (makes perfect sense as the Kawai factory was turning out those Teiscos at the time). And if that isn't cool enough, the tuning keys have CLEAR enclosures. Talk about space age tech. Currently listed on eBay with a $400 starting price and a Buy It Now of $600. Thanks to Jaimie Muehlhausen for bringing this one to my attention.